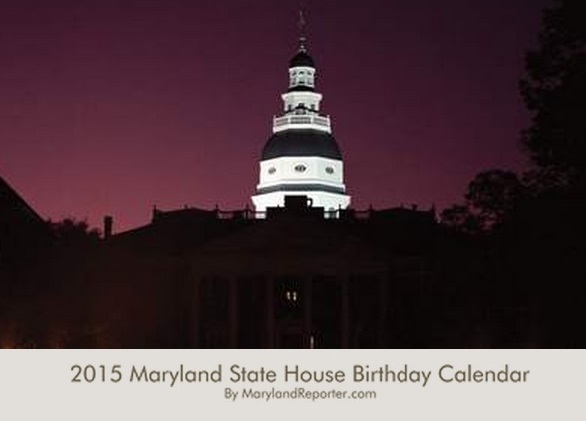 Get the new 2015 Maryland State House Birthday Calendar produced by the staff of MarylandReporter.com. It includes the birthdays of all 188 members of the incoming Maryland General Assembly — including all 58 newly elected members of the House of Delegates and 11 newly elected senators. There are also the birthdays of all statewide elected officials and Maryland members of Congress. This is a unique gift for staff, clients, lobbyists and activists. The calendars are $30 a piece, and $15 of that is a tax-deductible contribution to MarylandReporter.com. Five to 14 calendars are $25 each; 15 or more calendars are only $20 each. More details on purchasing the calendar below the photo. Since we are not Amazon.com, to buy calendars is a two-step process. Send an email to Len@MarylandReporter.com specifying the number of calendars and the shipping address with a phone number. The calendars will be on sale through January.